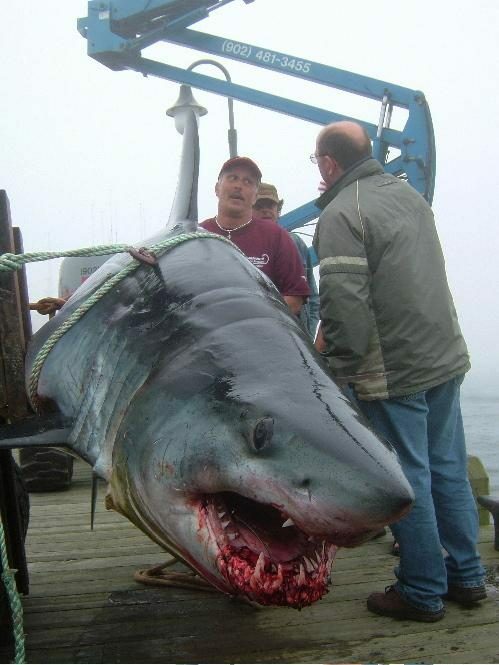 Rumor: Photographs show a half-ton shark caught in Yarmouth, Nova Scotia. 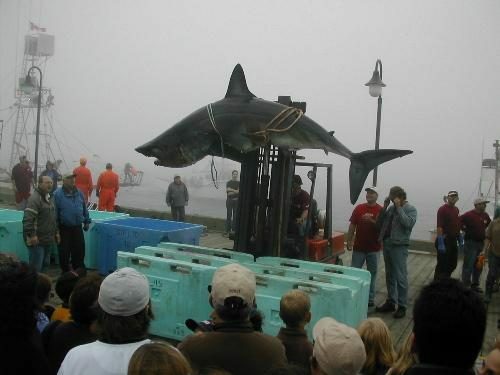 Claim: Photographs show a half-ton shark caught in Yarmouth, Nova Scotia. This Mako was hooked in the mouth, only fought slightly for 15 minutes, came up along side of the boat to have a look, long enough for one of the crew to put a rope around it tail!!! That’s when the s**t hit the fan!! The shark took off towing the 42 foot fishing boat backwards through the water at about 7 Knots. Just like in JAWS. The boat was taking on water, the Shark would jump completely out of the water at times. This went on for an hour before the Shark actually drowned. He weighed in at 1035 LBS. Origins: The photographs displayed above, and the caption identifying them as photos of a half-ton shark taken during a “Shark Catch in Yarmouth, Nova Scotia,” are indeed real. In a scene reminiscent of “Jaws,” the fish tugged the boat sideways [and] surged to the surface near the bow, a mako with a broad head and rows of razor teeth, chewing through steel leader. Doucette reeled it in and other anglers wrapped it in ropes as the shark chewed through the knots. One loop circled its torso, the other the tail; one man leaned over the boat and slit its throat as Jaws thrashed for something to bite. It died 20 minutes later. I felt bad that we caught her at the prime of her reproductive cycle. When they get to be this massive they call them queens of the sea. I would have let her go if I had been by myself, but it’s different when you have four or five other guys on the boat. You’ve got to win. that’s when the **** hit the fan!! of food. Although mid 60 degree water is considered ideal for these sharks, the larger ones can tolerate water in the low 50s. Los Angeles Times. 2 November 2004. The Baltimore Sun. 9 March 2008.